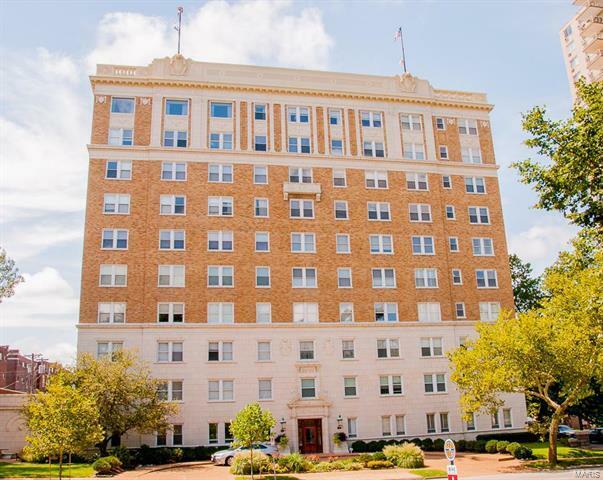 Nice 4th floor unit in the Versailles across from Forest Park! This 1 bedroom unit retains much of the historic charm including original wood floors, original moldings, casing and trim. Unit features an eat-in kitchen, large living dining combo, separate bedroom, and two large storage closets. This unit also comes with a separate storage space and assigned underground parking space. Stately historic building is equipped with secured entry and a 24 hour doorman. Highly walkable location and in one of the most desirable urban environments in STL! Across from Forest Park, walking distance to Wash U campus, and 2 blocks to all that Demun has to offer including Demun Oyster Bar, Sasha's, and Kaldi's. Convenient to both Downtown STL and Downtown Clayton. Unit needs updating and paint and is priced accordingly. Condo includes electric, water, sewer, heat, hot water, and master insurance policy. Seller willing to credit 6 months HOA fees for right offer! Take 40 West to Clayton/Skinker; Right on Skinker, Left on Rosebury, Park in circle drive off Skinker or on Rosebury. Enter in off Skinker Entrance- buzz doorman for access. Doorman can lead you to the 701 Elevator.